Rising from stormy seas, the giant turbine towers of an offshore wind farm seem almost miraculous to the untrained eye. But how do you put them there? Most boats do not have legs. But a jack-up barge has six, protruding high into the air when the ship is in transit. Extending to a length of 48m from the bottom of the ship, and penetrating up to 5m into the sea bed, the "legs" of these ships provide a stable "ground" in a place where there is only roiling water. As the legs push down, the ship is lifted above the waves. Purpose-built at a Chinese shipyard, the £60m jack-up barge MPIO Resolution is an extraordinary piece of engineering in itself. With a solid platform achieved, the windmill is fixed into place using a crane from the ship. These procedures are becoming more common as the drive goes on to increase wind power. If government targets are to be met, the UK could have as many as 7,000 offshore wind turbines by 2020. In the process, it would increase the amount of energy produced by that means about 60-fold. The building of each offshore site tends to be contentious, with complaints about disruption to wildlife and eyesores. And after surmounting any planning concerns, the big engineering question of putting the turbines in place remains. The giant jack-up barges are purpose-built for the expanding industry and one such vessel is the £60m MPIO Resolution. Its most recent appointment has been to help with construction of the 60-turbine Robin Rigg scheme in the Solway Firth, about six miles off the south west coast of Scotland. In August last year, the £325m scheme's progress was delayed by the late arrival of another jack-up barge, the Lisa A. Then 38 workers had to be rescued from Lisa A after it started to list dangerously. It was taken to Belfast to undergo checks and the Resolution was drafted in. The barge itself is a major piece of construction to overcome the difficulties of working at sea. The vessel was purpose-built at the Shanhaigun Shipyard in China and delivered to the UK in February 2004. On average, it takes about 24 to 36 hours to install wind turbine foundations from a vessel like the Resolution. At locations where drilling is required, it can taking closer to three days. Then the vessel often has to wait for high water to allow it to move to the site of the next turbine. Finally, it can return to fit the rest of the structure - usually in a period of about 24 hours for each turbine. E.ON, the company behind the Robin Rigg project, has been philosophical about the difficulties encountered in the Solway. "The offshore environment does present a number of challenges that you don't face onshore," said a company spokesman. "However, offshore wind does offer a number of advantages such as the potential to build larger and more powerful wind farms. "Certainly the availability of vessels capable of carrying out offshore work is an issue. "And there's always the possibility that bad weather and high seas can affect construction, but the more we learn about building these projects the easier it will become." Offshore wind farms like Robin Rigg play a key role in helping the UK deliver its renewable energy targets, E.ON believes, and in teaching lessons for the next generation of bigger, more powerful wind farms. Which may mean we see more massive jack-up barges patrolling the waters around the UK in years to come. Below is selection of your comments. The Resolution's original owners went into receivership even before the ship was complete. Its new owners are a local company who keep it based on the Tees and now have long term contracts to install windfarms. We should do more to ensure that people with the vision to keep such projects alive are encouraged to do so and put Britain in the lead in this field. Why not use old rig platforms - less cost and more turbines. I see lots of comments about how it would be great to build such 'wonders' in the UK. I've got news for you: jack-up barges were built in the Clyde for 30 years, at the old John Brown Shipyard at Clydebank. I surveyed them and took them down the river for most of these years. This Chinese one is purpose built and is self-propelled, more like a ship with legs than a barge but the principal is the same. Former jack-ups could not be used as it would be too costly to modify them and remove the drilling derrick. This one is a 'mini'. Some of the Clyde-built ones were very big indeed having legs 500 ft in length. Why not put the turbines on the sea bed? Sea water is over 800 times denser than air and a non-compressible medium, so an 8 knot tidal current is the equivalent of a 390 km/hr wind speed. And tidal power is predictable to the minute for centuries ahead. Renewable energy, such as wind farms, is an obvious "must". And location off-shore is the least invasive. But will there be serious risks of collisions by shipping? Could a collision cause serious power disruption? The windmills look beautiful and are a huge salvation for energy needs. As Radio 4 pointed out in a recent podcast, mirror-driven steam turbines powered by the sun in the Gobi desert can deliver 16% of Europe's power too. When can we be rid of the grip of the oil barons? Offshore wind is only viable if heavily subsidised and the huge costs of transmission infrastructure from remote locations and the cost of keeping back up supplies on standby are charged to others. The real cost of wind power to the consumer is over 25p per kwh. I think that wind turbines are a fantastic piece of engineering, they appear graceful on the landscape, all governments should veto any local government body's that delay the erection of these, nature is a wonderful thing and any short term impact caused during construction will heal, i care about my planet, so lets stop the nanny state, the idle rich that have nothing better to do than cause delays stamp there feet and complain because we will not have a planet soon. I was part of Global Marine and took part in the installation and commissioning of the world's first commercial offshore windfarm at Horns Rev, 11 miles off the coast of Denmark. Then we used a "dumb" jack-up barge (it had to be towed). The problems we encountered during installation were setting the project timelines back, weather and the fact that it was a learning curve for all. This vessel certainly makes life safer and easier for all in a hostile environment. I think this is a wonderful piece of engineering that will deliver a much needed boost to our cleaner, more greener energy needs. What still puzzles me is the amount of opposition to these offshore farms. I cannot see how the wildlife could be severely impacted and if it is then surely the impact is less than the longer term prospects of climate change. It makes me wonder if it is the same people campaigning against these wind farms, who also demand less use of the coal, gas and nuclear power stations. No doubt they would also find a complaint about a safe and efficient fission reactor when the technology is introduced. Perhaps the designers of this barge should read your excellent article on the use of a parasail in shipping vessels. It seems that at least three sails could be employed on this type of vessel. Amazing, but there's really nothing fundamentally new about these vessels. The offshore oil and gas industry has been using jack-up rigs for many years in relatively shallow water. The principle is the same and I'll warrant that most of the technology for these vessels comes from the offshore hydrocarbon industry. Interesting, isn't it, how the technology developed in one energy industry is being used in another energy industry that seeks to supplant (or at least complement) the first? Wind turbines are very good, both onshore and offshore. The engineering technology behind them is very complicated and quite advanced (having worked for a wind turbine company in a previous job). Can you please stop referring to them as windmills, as they are not used for milling anymore. These are wind turbines and not windmills, which use the wind to grind the corn. Awesome, I always loved Meccano. I have spent a lot of time working in Scandinavia and found the people there can not understand why the UK population are so against wind turbines. They are proud of them. I look in awe. I've seen Resolution working off the Skeggy coast - it's quite a sight to see. Especially at night. It's just a pity the UK shipyards cannot produce such vessels as MPIO Resolution. They'd have a lucrative market there. A point, often forgotten, is the time factor in building these wind farms. For all that the detractors talk about the relative cost compared to nuclear power, they ignore the decades required in time to build and decommission nuclear, compared to the few months obviously needed for an offshore wind farm. Why do we always come back to the bottom line of the costs spreadsheet, why not the relative benefit? I like to put a wind turbine in my garden. A planning permission is required, which I think is headache, and costly. Why does the govt not make it easier, so people like me can get one is fitted, and benefit from it. How long will it take for these ships to off-set the amount of energy it took to fabricate them? £60m? Is there a reason why the barge could not have been built here? Or is it so we can meet our carbon targets here? It's good to know that we and our businesses are moving manufacturing to a country that has such an appalling human rights record. Why do we have to use foreign shipyards, whatever happened to our own? Amazing engineering. Bring it on wind, wave, tidal, solar, geothermal etc. We're awash with free energy, the sooner we harness enough to replace carbon fuels AND the expensive and polluting nuclear power the sooner we will have a warm, cosy, clean and secure energy supply without having to rely on or be at the whim of hostile gas/oil exporters. Impressive stuff, and it's got me intrigued. 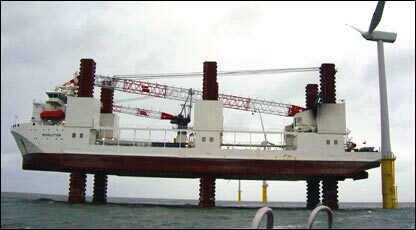 How are the turbines held in place on the sea bed - what stops them falling over? How are turbines built at sea? Well, we're not much wiser after reading this item. What are the wind turbine foundations made from? How are they fixed to the sea bed? How is the tower fixed to the foundations? Lots of detail about six-legged ships but the basic question posed in the main page link is unanswered. Maybe new to wind turbines, but the offshore oil industry has been using jack-ups for decades. All over the world. Hundreds of them. Did we really keep it so quiet? Whilst I agree that we need to build these offshore wind farms, why on earth are we buying specialist ships made in China? Surely we have plenty of ship yards more than capable of building these ships in the UK. The government should do everything in its power to ensure the ships are designed and built locally to support the shipbuilding industry and communities in the UK. I'm all for renewable energy, but how much energy is required, and what is the environmental impact, of building these barges, let alone the wind turbines? Have the environmentalists and politicians really considered all the costs? I love the idea of offshore windfarms, not only does this aid renewable energy but this will help the marine ecosystems recover from the over fishing of the last generation and provide long term spawning grounds for much of our marine wildlife which needs our protection also. The Resolution is soon to start installing 54 turbines on the bases put in the Wash last year. It will bring six from Denmark, install them and return to Denmark for another six - what a carbon footprint. You forgot to mention that it fell over recently. This project, and others like it, can make an immense contribution to what should be a determined and single-minded policy of energy self-sufficiency. This is a volatile world in which we are increasingly becoming dependant on others for our energy. Tomorrow's conflicts will be fought through gas pipes and energy reserves, so let's be dependant on no-one. This is an irrelevance - we should build our own wave platforms to operate off the Outer Hebrides. What happened to Salter's Duck and other relevant technologies that are more suited our maritime geography? I don't care if it's a little more expensive to produce. That will only be short term until more and more wind farms enter into service. Renewable energy sources MUST be of the highest priority. Nuclear core bunkers, covering them in thick concrete and leaving them for our children to sort out is NOT an answer, and makes me feel quite sick that my generation have promoted this. Shame there was no mention of the engineers. I just wonder if the maintenance of these structures will require equally as large an investment in specialised equipment? Turbines will go wrong and weather being what it is will cause WOW (Waiting on Weather) to be a major performance issue as it is for the oil & gas Business offshore. You can imagine the HSSE issues getting people up there to work on repairs and routine care.